The future of energy medicine is here! Pills and potions are passé. Medicine is now integrative, vibrational and holistic. The Energy Evolution is blurring the lines between traditional and alternative medicine. Quantum Energy Medicine involves cutting-edge technology and information. Physical presence is no longer a barrier to receiving healing. No wonder Quantum Energy Medicine is also called cyber medicine! 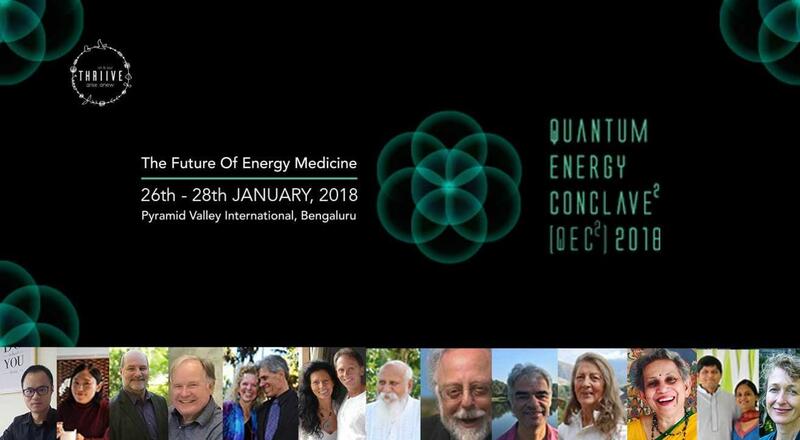 Join the Quantum Energy Conclave2 (QEC2) and experience the new way to heal! Michael Larry Beasley (USA) - Secrets to SCENAR efficiency. Ilona Selke (USA) - Living in a Holographic Universe. Dr. Nipa Das (UK) - Energy Medicine Simplified with Quantum Life Infinity App for healing. Visit Medlabs, the Quantum Energy Healing laboratory pioneered by PVI, to personally experience Radionics and Scenar Cosmodic, and high precision Quantum Energy diagnostic tools like Scenar Cosmodic, Radionics SE-5, Qlaser, Timewaver and many more! Align your physical and spiritual body in the serene vibrations of the lush, green Pyramid Valley, flanked by hills on three sides with a water body running through it. Browse and buy books authored by the speakers, past and present, in the bookshop. One-on-one interactions with the masters during the day and at mealtimes (where sattvic food is served) often lead to forming mutually empowering bonds. Lightworkers, alternative health and wellness therapists, scientists, doctors, students, spiritual seekers and anyone interested in expanding their knowledge of Energy Medicine. What is Thriive Art & Soul? Thriive is a theory. A simple one - a belief that all it takes to transform the ordinary to extraordinary is a pulse of energy. That all it takes to go from struggling “inside the box” to leaping “outside the box” is but a vibrating thought. A single instant, a moment of light, a revelation can at times break down those walls, and suddenly we begin to Thriive. A growing network of Thriivers, it includes people of all kinds - homemakers, teachers, lawyers, entrepreneurs, artists, musicians, actors, healers, therapists, and global coaches. Cancellation on or before January 15th, 2018: 50% of donation amount refund. Cancellation between January 16th - 23rd, 2018: 25% of donation amount refund. Cancellation on or after January 24th, 2018: No refund. Transferring of the participant entry to another person is allowed upon request if adequate notice is given. The Pyramid Spiritual Trust reserves the right to alter any aspect of the event due to any events beyond the control of the Trust. We reserve the right to cancel any part of the event because of circumstances beyond our control. There will be a refund of the donation in such a case.